Travis Lulay entered Friday night’s home game against the Montreal Alouettes as the BC Lions’ No. 1 quarterback. Against the odds, the 33-year-old had proven himself to be head coach Wally Buono’s top option, ahead of the younger Jonathan Jennings. He looked like the Lulay of old. And with one play, it could be all over. Lulay suffered a serious knee injury in the second play from scrimmage. His season is over, and given his advanced age, his career might be done too. Lulay scrambled and ran, looking for a first down. He was hit by two Alouettes players, but TSN’s Farhan Lalji reports that the injury is believed to have occurred before the collision. Lulay was seen wiping tears from his face on the sidelines, knowing what a serious injury could mean at this point in his career. 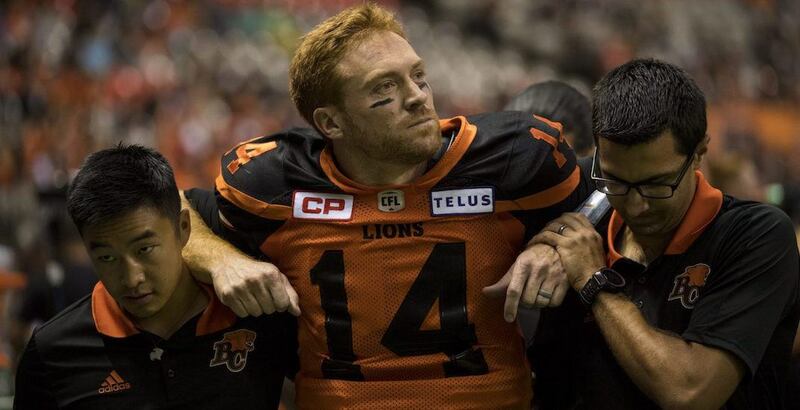 If Lulay is indeed out for 12 months, as News 1130’s Rick Dhaliwal suggests, this could be a career-ending injury. Just a quick note of thanks to everyone that reached out with words of encouragement after last night’s game. I received many thoughts, prayers, and uplifting words from Lions teammates (not to mention a big W!) and fans – along with messages from competitors and fans all across the CFL. You all help to ease the sting of a disappointing moment. As cruel as the game can be at times, I was once again reminded why I have come to love this league. There is no shortage of good people in CFL circles, and I’m grateful for you all. Cheers.